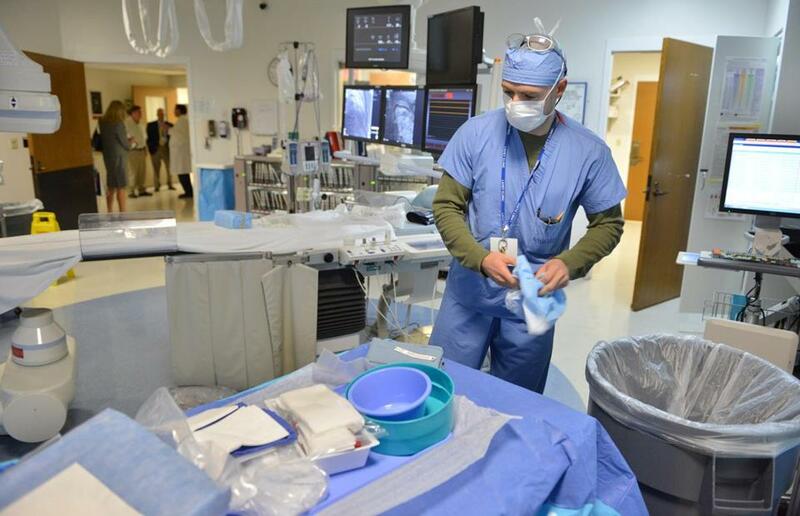 Nurse Michael Sladick prepares a cardiac catheterization lab for a procedure at the Lahey Hospital & Medical Center in Burlington. r. Howard Grant, the president of Lahey Health, believes that bigger is better, at least during this period of changing health care. Keeping with his philosophy of partnering with area hospitals to provide better and more cost-effective medical care, Grant has been busy the last few months discussing expanding Lahey’s health system. Last week, he met with representatives from Anna Jaques Hospital in Newburyport to discuss a possible affiliation. He also signed an agreement with Atrius Health that designates Lahey Hospital & Medical Center in Burlington as a preferred hospital for the medical group’s patients in the Burlington area. 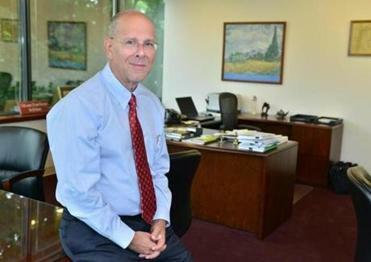 CEO Howard Grant is working to widen Lahey Health’s network. The agreement with Atrius comes just weeks after Lahey and Winchester Hospital signed a letter of intent to affiliate. Also, since the spring, Grant has held ongoing talks to merge with Beth Israel Deaconess Medical Center. Last year, Lahey captured a part of the increasingly competitive market share north of Boston, when it merged with Northeast Health System and took over Beverly Hospital and Addison Gilbert Hospital in Gloucester. When it comes to pitching partnerships, Lahey can point to its bottom line: Last year, the nonprofit earned $52 million, according to Lahey spokeswoman Isabel Black. Ellen Lutch Bender, president of Bender Strategies, a Newton health care consulting firm, thinks Lahey is positioning itself as an attractive option to smaller hospitals that realize they cannot continue to operate independently. “As hospitals are perusing alignment strategies, there will be very few institutions that will be standing alone at the end of the day. Nobody wants to be the hospital that doesn’t have a seat at the table when the music stops,” Bender said. With the costs of infrastructure and technology soaring, insurance reimbursements tightening, the number of independent community hospitals continues to shrink — leaving 12 independent hospitals in the state, and just two — Anna Jaques Hospital and Lawrence General Hospital — in the region north of Boston. Then there’s the ongoing national debate about President Obama’s plan to introduce universal health care. 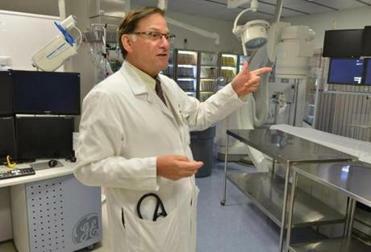 Dr. Richard Nesto, head of cardiology, in one of the cardiac catheterization labs at Lahey Hospital & Medical Center. Lahey, which opened in Boston in 1923 and moved to Burlington in 1980, changed its name last year from the Lahey Clinic to Lahey Health after its merger with Northeast Health. It offers 619 beds across its hospitals in Burlington, Peabody, Beverly, and Gloucester, has over 1 million patient visits a year, and employs 11,000, including 1,200 doctors across 19 communities. With health care reform evolving, and as insurers transition from a pay-per-service to a flat rate reimbursement where health care providers are rewarded for preventive patient care, Lahey has actively sought to affiliate with community hospitals, such as Beverly and Winchester. Winchester Hospital’s board has yet to vote on the proposed link with Lahey. Winchester, a 229-bed facility located 6.5 miles from Lahey’s flagship medical center in Burlington, earned $8.85 million during the last fiscal year, according to hospital spokeswoman Toni-Lynn Hansen. Grant, Lahey’s president, said partnering with Winchester makes fiscal sense and would allow residents who live in the same region to be part of a unified health system. “We’re each taking care of probably 20 to 30 percent of each other’s populations, but we’re doing it in a completely disorganized fashion,” he said. In the proposed alliance, four Winchester Hospital representatives would become Lahey board members, similar to what occurred when Beverly Hospital merged with Lahey, Grant said. Denis Conroy, who helped oversee the Northeast-Lahey merger that brought Beverly Hospital, Beverly Hospital at Danvers, Addison Gilbert Hospital, BayRidge Hospital in Lynn, and other programs such as assisted living and psychiatric services into the Lahey system, thinks there was no other option but to merge. “We didn’t think that we would go out of business as an independent institution, but we were afraid we wouldn’t be able to thrive,” said Conroy, president of Beverly and Addison Gilbert hospitals. Beverly’s biggest revenue generator is orthopedic surgery and care, and its cardiology unit — which performs angioplasty but not open-heart surgery, Conroy said. Conroy said the affiliation with Lahey grants the hospitals — and their other facilities — access to Lahey’s new $162 million electronic records system that would not have been affordable if they stayed independent. In addition, there are other collaborations — Beverly Hospital has seen its occupancy rate jump about 5 percent from Lahey referrals since the merger (the occupancy rate in fiscal 2012 was 74 percent), and Beverly has sent cancer patients for treatment to Lahey Medical Center in Peabody. Conroy rejects the notion that Lahey may be building a monopoly north of Boston. He pointed to competition from North Shore Medical Center, a member of Partners HealthCare, founded by Brigham and Women’s Hospital and Massachusetts General Hospital. North Shore Medical Center runs Salem Hospital, Mass General/North Shore Center for Outpatient Care in Danvers and Union Hospital in Lynn, and has a staff of nearly 600 affiliated physicians in over a dozen locations. In downtown Beverly, there was mixed reaction to the merger trend. Bob Nelson said larger providers, such as Lahey Health, bring needed services to Beverly Hospital. “With today’s technology and speed of information, it’s better to go to a bigger hospital. Small hospitals are great for minor injuries, but you want to have access to specialists and that’s what happens when people go big,” said Nelson. Demetrios Hillios, another Beverly resident, said the move toward consolidating community hospitals with larger medical centers could bring better care but also a bigger bureaucracy. “People could get lost in the shuffle,” said Hillios. Nicholas, of the Massachusetts Hospital Association, thinks that as more hospital mergers take place, consumers will have increased options. globe.com. Follow him on Twitter @WriteRosenberg.